The Siri personal assistant application for the iPhone 4S has been ported onto the iPhone 4, supposedly proving that the older hardware is capable of running the app. Developer Steven Troughton-Smith installed the Siri and Springboard files from the 4S onto an iPhone 4 and was able to get it working on the previous generation device. 9to5 Mac, which is working with the developer, reports that the app can recognise your spoken commands and speak back to the user. It also works in both standard view and on the keyboard dictation view. Naturally, Apple is not authenticating commands to its servers when using the iPhone 4, but that's the only thing preventing the Siri being fully functional on the device. A4 processor does the trick after all? Apple has said that Siri is only for the new iPhone 4S with the inference being that the A5 processor is required to handle the app. The port, which is still being perfected, proved that Siri can run on the iPhone 4 if Apple ever decides to open it up to the older device. 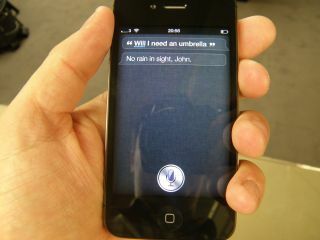 Check out Siri in action on the iPhone 4 in the video below.